The winner of the Caine Prize 2012 was announced on July 2nd - and congratulations again to Rotimi Babtunde for his win. Bombay's Republic was one of my favourite stories (the other was La Salle de Depart) so I am glad it won. I would like to say thank you to the New Internationalist, publishers of the Caine Prize Anthologies, who gave me a copy of this years Caine Prize Anthology (can I say I still get super excited at being contacted by publishers and authors for books, and I don't think that excitement will ever go away). I really wanted to read and review it to coincide with the release of the anthology/announcement of the winner, but I didn't get a chance and so the review is coming in a few days later than I hoped. 'these fifteen stories show yet again the richness and range of current writing on the continent. They underlined the primacy of the short story, with its oral antecedents, at the very heart of African literature'. In addition to the five shortlisted stories, Bombay's Republic, Urban Zoning, Love on Trial, La Salle de Depart, and Hunter Emmanuel, there is a story about two brothers, Cephas and Erabus, walking into the city's 'downtown jungle of skyscrapers'; another about a young girl who loved watching her Mama's walk home, because it was 'a gentle reminder that said I mattered'; a boy who on his 18th birthday is finally able to move forward after the tragedy he (and his family) experienced 2 years ago; a mother struggling to cope with her new baby; a man named Buda, who in mid-January, needs work as everyone is broke after the splendour of December. Buda navigates the city with his lack of funds, until he meets Mwangi (a young man from the IDP camp constructed in his city), who he 'enlightens'; a nurse, who arrived in Cape Town five years ago, but had to work as a security guard because her qualifications weren't recognised; a lesbian thinking of leaving her partner because now 'she wants to spend more time with men'; a story about illegal mining in Zimbabwe; a story about an interesting relationship between a young black woman and an older white woman; and a story about a woman, who on a seven hour trip from Cape Town to Namibia, thinks back to a time when a tragedy happened. I have said quite a few times I am not the biggest fan of short stories, but dare I say I might be slowly changing my mind. 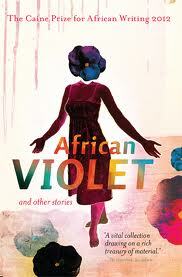 African Violet was a lovely Anthology and I really enjoyed all the short stories in it. My favourites from the workshop stories had to be 'Mama's Walk' by Grace Khunou, 'Moving Forward' by Lauri Kubuitsile, 'Table Manners' by B M Kunga, and I'm torn between 'The Verge' by Rachel Zadok and 'Pillar of Love' by Beatrice Lamwaka. I have to say I also loved the fact that some characters in African Violet drove Rav 4's, owned iMacs, iPhones and Leica's. There were wealthy Africans in the Anthology, but also Africans trying to make a living. When talking about this year's shortlisted stories, Bernardine Evaristo said she was 'looking for stories about Africa that enlarge our concept beyond the familiar images that dominate the media, War-torn Africa, Starving Africa, Corrupt Africa - in short: The Tragic Continent'. For me there was no sign of 'The Tragic Continent' in the Anthology (both with the shortlisted and workshop stories). If anyone else has read the 2012 Caine Prize Anthology I would love to know which one(s) were your favourite, and if you have read previous anthologies has it moved beyond the 'tragic African narrative'? Now I really need to stop making excuses and read the 2010 and 2011 Anthologies that are on my shelf. A list of past Caine Prize Anthologies can be found here. And something that made me smile. This year, the collection will be published by New Internationalist in the UK and by Jacana Media in South Africa, as well as in five other African countries (Cassava Republic (Nigeria), Sub-Saharan Publishers (Ghana), Kwani? (Kenya), FEMRITE (Uganda) and Bookworld (Zambia) - a first for Caine Prize. I know Cassava Republic already co-publishes the Anthology for the Nigerian market and Kwani? for the Kenyan market, but I am really glad that there are three more African co-publishers this year. Lovely collection. Much better than the 2011 Caine Prize Anthology. 'Elephants Chained to Big Kennels' by Mehul Gohil and 'Moving Forward' by Lauri Kubuitsile are my favourites. I really must read the 2011 anthology now. 'Moving Forward' was beautifully written and you are very right about 'Elephants Chained to Big Kennels', it's different. You're very welcome. And I'm really happy they are working towards making the anthology readily available in more African countries. What's the point in it being a collection of African short stories, if many Africans themselves cannot access it? That is wonderful news!! It is great that the anthology is also going to be available in Zimbabwe. Would it be possible to know when it will be available in Zimbabwe? Thank you! It is available now - in both Bulawayo and Harare. 'Elephants Chained to Big Kennels' is an inspired story. Very complex story. Some great sentences in there. It speaks with a unique voice. it is really a unique story and I love that it's the first of the workshop stories in the anthology. I like that Table Manners by B.M Kunga and Mama's Walk by Grace Khonou take a familiar concept-motherhood-crap all over it and at the end still have these terrible mothers walk away on top, empowered by unfathomable acts. It's powerful stuff, flirting with taboo-great fun! I completely agree with you - the way the mothers were portrayed, especially in Table Manners, is definitely not the way mothers (and especially African mothers) are portrayed. I remember having to read Table Manners twice, just to make sure I read it correctly. The two stories from the workshop that can hold a candle to the shortlisted ones are Table Manners by BM Kunga and Elephants Chained to Big Kennels by Mehul Gohil. Table manners is a well crafted story with lots of psychological nuance, written with dark energy. The Elephants story sounds like it was translated into English from an alien language spoken on another planet - a unique take on where modernisation and technology will lead us. Sorry for late reply but I love that you said that about 'Elephants Chained to Big Kennels' "like it was translated into English from an alien language spoken on another planet". I couldn't have explained it better even if I tried. I kept on thinking while I read it, that this really is something I haven't read before.